A great send-off from Oxford: my colleagues from Grant Thornton showed up to give me some moral support and walk a few miles of the way to John O'Groats. It was good to have company over the familiar fields to Cumnor and down the Thames to Farmoor. Then it was solo again to the B&B at Ramsden. Next day took me through the Wychwood, into the Cotswolds and to Stow on the Wold youth hostel for the night. On Day 29 I joined the Heart of England Way, and as far as Chipping Campden I had many other walkers for company. I left the Cotswolds at Lower Quinton, where the public footpath passed through the sand pit of the long jump at the village school! I stopped for the night at Long Marston. Day 30 was a long one, but easy going through the rolling Warwickshire countryside to Alcester and Henley in Arden. I was surprised how remote the country seemed, despite the closeness of the West Midlands conurbation. Next day was more of the same, with the bonus of the amazing medieval parish church at Berkswell. From the B&B near Meriden, I made my way north across the M6 by a farm track and on to Kingsbury. Then another accommodation crisis: I had hoped to reach Lichfield, but it was the Lichfield Festival and Lichfield was fully booked. I settled for a B&B at Middleton, a little off my route and off my map. So Day 33 started with a routefinding problem, and some road walking as I worked my way back to the Heart of England Way. 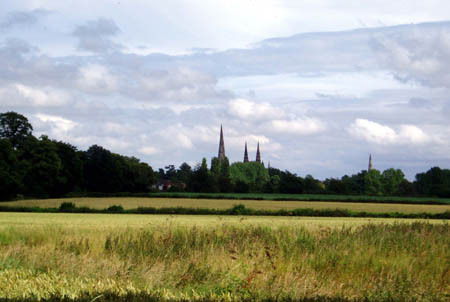 Then it was a fine walk, the distant spires of Lichfield Cathedral coming ever closer. A quick walk through the shopping centre of Lichfield was followed by more fine countryside to Cannock Chase. From Castle Ring, I could make out the distant Peak District: the North was in sight. I stayed that night in Brereton, just down the road from Rugeley power station. Next morning, the towpath of the Trent and Mersey Canal made a pleasant route out of town. I joined the Staffordshire Way, which was well signed except on the land of the South Staffordshire Water Company around Blithfield Reservoir. There the water bailiff stopped me using a perfectly safe and well used route across the dam, and sent me through a field with a Jersey bull in it, which eyed me menacingly. At Abbot's Bromley I met Susan for lunch, then headed for the B&B at Uttoxeter. Day 35 was a day of transition from the hedgerows of middle England to the uplands and drystone walls of the North. From Rocester, the hills got higher, and from the southern fringe of the Peak District I could look back over two days walking to Cannock Chase. Then I headed for the B&B at Thorpe. 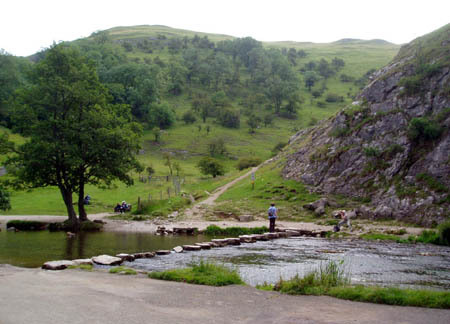 I had seen four other walkers since the Cotswolds, but next day through Dovedale I saw four walkers every 10 minutes. At Monyash I joined the Limestone Way to Miller's Dale and the youth hostel at Ravenstor. Day 37 saw more good walking to the end of the Limestone Way at Castleton, then over Hollins Cross to the youth hostel at Edale.